Taking responsibility for home defense is a serious matter. Here are six new products for 2018 to help in this endeavor. Bernie stopped what he was doing and turned around, “Really? How could that happen?” It occurred to me that Bernie didn’t watch a lot of movies. In a real life-or-death situation, a home invasion isn’t a laughing matter, and unfortunately, it’s become a much more common occurrence. If a hammer or a nail gun is all you have to defend yourself, that’s better than nothing — but there are much better options. Home invasions happen every day, and it’s only reasonable to be fully prepared. Many of the people I train are relatively new to firearms, and most want to purchase only one firearm for their daily protection. For that to occur, the gun chosen must be concealable, so the home defense gun functions as the same gun that’s carried on a daily basis. There might be better options, but any handgun is definitely more effective than a nail gun. A great starting point for home defense is the personal firearm you carry every day. It’s something you’re comfortable with: It’s capable, and it’s going to be easy to access. Obviously, we have a myriad of good choices for carry guns, but for some people, many of those choices just won’t work. As an instructor, I often train older citizens who sometimes don’t have the hand strength to operate the slide of a 9mm or the double-action trigger of a revolver. For them, those choices are limited. With the introduction of the Smith and Wesson Shield EZ, that problem has been addressed. The S&W Shield has established itself as the most popular concealed carry handgun in America, and the first point of home defense comes with your daily carry handgun. While the Shield and other similar guns are great guns, they require more hand strength than some people are able to generate. The Shield EZ resolves those problems by providing a .380-caliber pistol that’s larger and therefore easier to manipulate than the pocket-sized guns. The lighter caliber and slightly heavier slide allow for a very light recoil spring. The rear of the slide is recessed in the gripping area, providing a better surface and shape for hands weakened by arthritis and time. The trigger has a lighter break and is more tactile in reset. Magazines are easier to load, and the Shield EZ has a passive grip safety, allowing safe carry with or without the optional manually operated safety. The upshot of this is that Smith & Wesson has finally developed a defensive pistol that can be operated by nearly anyone, allowing people with less hand strength the ability to defend themselves both at home and away from home. Whether you like lasers or not, most people fail to consider that 70 percent of defensive situations occur in low light. The ability to see is of particular importance in a nighttime home invasion. The Crimson Trace Laserguard Pro light/laser combination mounts to the lower frame of the gun with a rearward extension that provides a front-mounted activation switch. Normal gripping of the gun passively activates the laser/light in four different chosen modes: light/laser, laser only, light only and flashing light/laser. Changing modes is accomplished by pressing the activation switch and the selector switch for five seconds. There’s also a bottom-mounted switch to turn the unit off. All controls are accessible when the gun is properly held in a two-hand grip. Properly set up, the laser isn’t the primary sighting system but rather a backup sighting system in the event of low-light conditions. Lasers should be set up so the shooter can’t see the laser when using a proper sight picture because it’s obscured by the front sight. The point of impact is only slightly higher if low-light conditions require use of the laser. This way, the shooter trains with the sights, but he or she has the option of using the laser in the event of a low-light defensive situation. Equipped this way, the light, sighting system and handgun are all one unit, and the only thing the defender who’s under the extreme stress of a deadly force event has to manage. The Laserguard Pro is available to fit multiple defensive handguns and is a viable asset in home defense. While I’m not an advocate of the Joe Biden-double-barreled-shotgun-fired-off-the-porch method of home defense, there’s no question shotguns are extremely effective in home defense, and they require less training to be used effectively. At close range, shotguns deliver a deadly and lethal blow. Mossberg’s Shockwave and Remington’s Tac-14 represent the ultimate in shotgun handiness and effective stopping power in a compact and affordable package. With a total length just over the 26-inch minimum length designated by the 1934 National Firearms Act and a weight of around 5 pounds, they’re effective, handy and easily stored. Capacity of the Tac-14 is 4+1, and it’s 6+1 with the Shockwave. Level of penetration of exterior walls can be controlled by choosing shot size from bird shot to buckshot. These new firearms represent a major step forward in home protection against an active invader. Taking an active role in defending your home means exposing family members, children and visitors to tools of deadly force, and laws require gun owners’ due diligence in keeping firearms out of the hands of those who shouldn’t have access to them. Whatever method of home defense you choose, you must have the capability to secure it. That method of security must allow you fast access and prevent access from others. Gun Box 2.0 does just that and without making it obvious a firearm is present and at the ready. Available in five colors and accessible by biometric, cellphone or RFID technology, Gun Box is available in sizes to accommodate shotguns, carbines or handguns, and some models even serve as a Bluetooth speaker system. It’s TSA and FAA approved, has a motion-tamper alarm and an internal light, and it opens automatically when activated. It’s truly the most innovative and user-friendly system I’ve seen. Pricing begins at $149. A major concern in any defensive situation is where the bullet goes if it fails to contact the assailant or if it passes through. While civilian defenders have a better record for collateral damage than sworn law enforcement, the fact is, you’re responsible for every projectile you launch. In home defense, excessive penetration is an extreme liability, and the new NovX 9mm ammunition promises to be both safer and more effective in those situations. NovX ammunition is a radical departure from conventional ammunition in several ways. The case is unconventional in that it’s partially aluminum and partially stainless-steel to provide corrosion resistance and self-lubricating properties for better feeding. The most drastic departure from convention is the projectile. Made from polycarbonate and copper, bullet weight is much lighter, just 65 grains for the self-defense load. A lighter projectile allows a much higher velocity — 1,655 feet per second. Another drastic departure is that the bullet is non-expanding and achieves a lethal wound channel by spiral flutes that push tissue away from the wound channel and create more damage than an expanding bullet. While it’s still new and stopping effects haven’t been established, the higher velocity and lighter projectile will certainly reduce recoil and reduce the likelihood of projectiles penetrating walls, making collateral damage less likely. Currently available in 9mm only, a round-nosed practice loading is also available. All of these are new products in a fast-growing segment of the firearms industry. Home defense is a serious matter and should be approached with serious consideration. Take your specific situation when making choices, and remember that any home defense plan is better than simply allowing yourself to be a helpless victim. Also, take into consideration that there are much better choices than a nail gun. 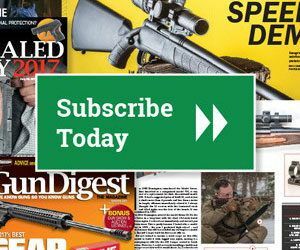 Editor’s Note: This article originally appeared in the March 2018 issue of Gun Digest the Magazine.